vegetation growing in this paradise is half nayarita type rainforest and wave having excellent for all kinds of water sports. In such a way that the practice of canoeing, rowing, sailing, skiing and surfing mainly, is delightful here in Guayabitos. Those who come to this destination in order to exercise in diving, generally are very satisfied, especially with the huge number and variety of underwater flora and fauna in these waters can be observed. Recommend specific to the waters around Crab Island and Coral Island to enjoy diving for corals, blankets, palmita, white flower, colorful fish and starfish that live there. Guayabitos offers everything a tourist could want and more. For example, boat rides are one of the favorite activities of those who come to have fun on the beach destinations. For Guayabitos, Nayarit state pride, this is no exception. Among the places visited as part of these tours are: the Bay of Rincon de Guayabitos, the islands and the Coral Crab, the beaches of Kiss and Tortugas. But the fun does not end in Guayabitos that. Who also like gastronomic tourism have much to explore in this corner of the state of Nayarit. The dishes prepared in this nayarita destination are exquisite and many of them based on fresh seafood. Turning to Crab Island and Coral Island, it is worth mentioning, the large number of seabirds that live there. Indeed, fans watching birds have guaranteed fun for the many pelicans, hawks, gulls, boobies and many other species that frequent these isles. 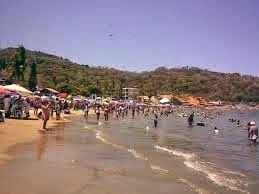 Another unmissable attraction of Rincon de Guayabitos, relates rather to the traditions and customs. And is that from 19 to 27 June, visitors can participate in the celebration in honor of Our Lady of Perpetual Help, considered the protector of this coastal community. As part of this festival takes place every day a grand pilgrimage through the main streets of the town, bearing the image of the Virgin, a veritable parade of fireworks, music, dancers and floats. The culmination of the pilgrimage is the entrance to the church where Mass is developed. To close with a flourish every day of this feast day, a colorful castle and a bull full of fireworks burned.